The boarders always have human companionship during the day. Our boarding dogs get divided into the play areas they are best suited for, e.g., puppy play, calm dogs, hyper run, older, quieter group, and so on. There are groups for all shapes and sizes. We supply blankets, beds, stainless steel dishes and Milk Bones at bedtime. All dogs have their own sleeping quarters, made to feel like they’re at home. 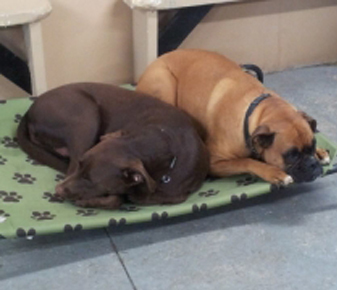 Every kennel has a view and a buddy that they can be right beside. Feel free to give us a call or pop in during business hours.